Loch Ness or Loch Lomond? L- 92,000 million ft3 / 2.6km3. N - 263,000 million ft3 / 7.3km3. L - Yes, massive, Lomond Shores at Balloch. N - Mostly at lochside visitor centres, smaller scale. L - Yes, in countryside and also in small lochside communities. N - As Loch Lomond. L - Plenty of stop-offs and viewpoints, some, like Firkin Point, very well known. N - Some, though less well-developed than Loch Lomond. L - Cuts through Highland Boundary Fault, embracing Lowland and Highland. Big hills like Ben Lomond close by. Fine deciduous woodlands in places. N - Fills part of a major geological fault line. Hills more uniform and less spectacular. Heavily wooded. L - Yes, plus extensive timetable of ‘water taxis’ and connections. N - yes, especially programme of monster spotting cruises. Bank traversed by busy main road? Alternative route on other bank? L - part-way by car (to Rowardennan) then good footpath. N - part-way by car (to Inverfarigaig) then all the way to Fort Augustus but not on loch shore. L - Glasgow, say, 30-40 mins by car. N - Inverness, say, 20 mins by car. L - 65 miles / 104 km (Balmaha). L - Good connections by bus and train. N - Good service, lochside buses. L - Yes, but less well known than Nessie. Alternative pretty loch in vicinity? L - Other lochs in nearby Trossachs: eg Loch Katrine. N - Loch Affric much prettier. Features in well-known traditional song? N - No. Ken Dodd's 1960s hit 'Happy Ness' is not about the loch. 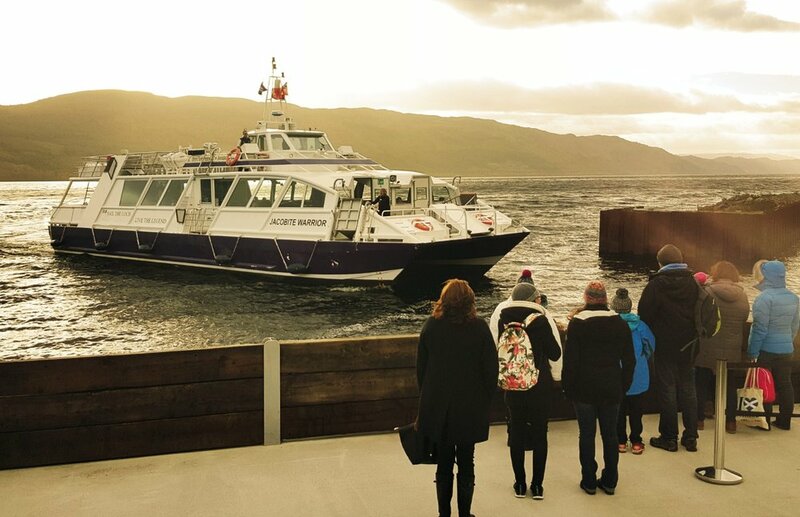 (Pictured here) Loch Lomond has a good choice of cruising and various piers and little destinations are linked together in a kind of ‘water-taxi’ service. This is Cruise Loch lomond at the pier at Tarbert. So, you are planning your route through Scotland and wondering if either of the two most famous bodies of water are worth a visit? Loch Lomond or Loch Ness? Are they worth a look? Visitors have heard of Loch Ness, of course, because of the monster myth, while Loch Lomond owes its fame at least in part to the well-known song ‘The Banks of Loch Lomond’. Loch Lomond is also famous through geography: it’s in a part of the Highlands that lies closest to the Central Belt, most densely populated part of Scotland. So that makes it easy to visit. (Pictured here) Loch Lomond, looking north from Duncryne Hill. One of the very best viewpoints anywhere near the loch. A view from the edge of the Lowlands into the Highlands. The Highland/Lowland demarcation - the Highland Boundary Fault - runs through the islands in the picture. Loch Ness occupies part of the Great Glen, for centuries a throughway between the east and west coasts of Scotland. Because it is further away from the heavily populated Lowlands, it has not had the long-standing reputation for beautiful Highland scenery associated with Loch Lomond. (Pictured here) With Loch Lomond’s reputation as a picturesque stretch of Scottish landscape dating back to the time of the Romantics, demand for illustration developed early. This print, for example, dates from 1835 and is typical of the exaggerated contours that contemporary taste preferred when viewing Highland landscapes. (Pictured here) The English watercolour artist E.W. Haslehurst RBA (1866-1949) was just one of many who came to Loch Lomond. In this case for a series of paintings used as book illustration. This is Luss Straits. (Pictured here) View north from the high ground near the Suidhe Viewpoint, on the B862, with the blue of Loch Ness distant and well to the right. But should I visit Ness or Lomond? "Wait a second" (I hear you say), "you haven't actually said which of the two you should visit." You noticed, huh? Well, both are on a well established tourist trail and neither are off the beaten track, (see links below) - far from it, actually. If you are a first-time visitor to Scotland, you'll tend to tick off the hot-spots first. So there is an element of 'unavoidability' about both these lochs as they are both on well-established visitor routes through Scotland..
Hey - since you ask - I'd rather be on the shores of (say) Loch Maree, Loch Assynt, Loch Hope and a load of smaller lochs further north. I'd rather see (say) Loch Arkaig or Loch Affric if I was nearer Loch Ness, or enjoy a stroll along the shores of Loch Katrine if near Loch Lomond.